2 ¼ tsp active dry yeast (1 pkg) See note. Follow your bread machine’s instructions, but it’s basically just putting the liquid ingredients into the bread pan, then adding the dry ingredients being sure to place the yeast on the very top of the dry ingredients so it doesn’t touch the liquid. Do not mix. (I do stir or whisk the dry ingredients together in a bowl before adding them to the bread machine just to insure they are incorporated throughout.) The machine takes over from there. It couldn’t be simpler! I find consistent success when I set my machine on the "dough" cycle so the machine is only assisting with the kneading and the first rise, which takes 1 hour 40 minutes in my machine. I then punch the dough down, and place it in a bread pan to do its 2nd rise which takes about 1 hour. Finally, bake in a 350 degree oven for 40-45 minutes. Note: I have the best results using “Red Star” Active Dry Compressed Yeast. In the package it looks like a hard block, but when you open the package it is loose just like in individual packet and jar form. I buy it in the commercial/restaurant aisle at my local Super One Foods Grocery Store where the large gallon cans and jars of food are. I had taken a bread making class at Chef & Co. in Brainerd, Minnesota and it's the yeast that the instructor recommended. It comes in a 16 oz. size. When you try this bread you will be making it on a regular basis so, even though it is a large quantity of yeast, you will use it before its expiration date. I store the yeast in a quart jar in the fridge labeled with its expiration date. *For white flour in all of my recipes, I use organic stone-ground Gold N White Flour. That is not the brand name. It is the type of flour. It is a "natural creamy-color unbleached wheat flour that is milled from hard spring wheat. It contains the essential nutrients of whole wheat, including the wheat germ, but has similar baking quality of white flour." It is available at food co-ops in the bulk section. I buy mine in a 25 lb bag through the buying club I belong to. It is milled by Natural Way Mills in Middle River, Minnesota. **One time I had no oatmeal, so I substituted Bob's Red Mill Old Country Style Muesli. What a pleasant surprise! "Old Country Style Muesli" is cereal that consists of whole grain rolled oats, wheat, rye, triticale, and barley, along with dates and raisins, sunflower seeds, almonds, and walnuts. 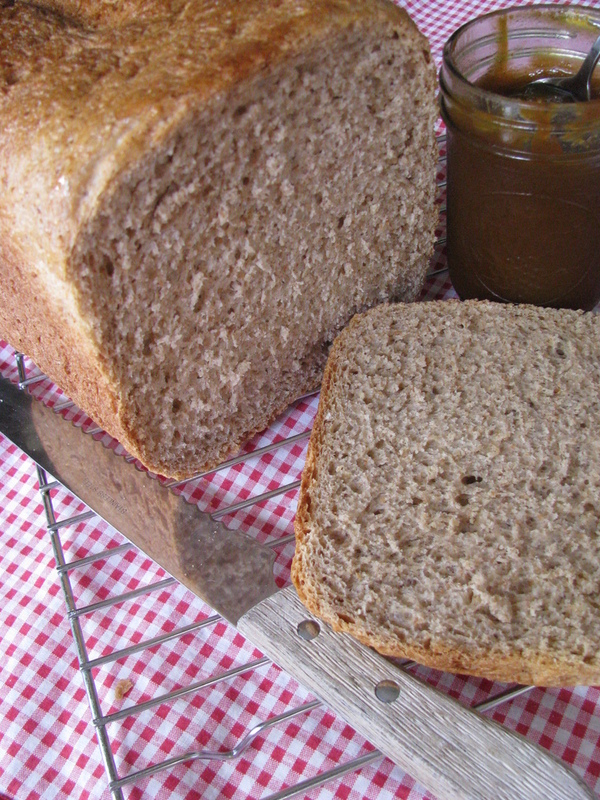 It adds a wonderful chewy and crunchy texture to the bread's already yummy flavor. I now use it instead of oatmeal everytime I make this bread.